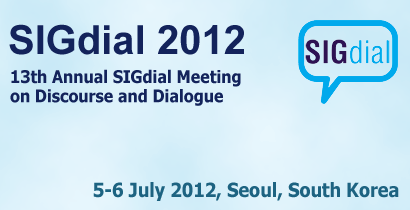 The 13th annual SIGdial Meeting on Discourse and Dialogue was held on July 5-6, 2012 at Seoul National University in Seoul, South Korea. The SIGdial venue provides a regular forum for the presentation of cutting edge research in discourse and dialogue to both academic and industry researchers. Continuing with a series of twelve successful previous meetings, this conference spans the research interest areas of discourse and dialogue. The conference is sponsored by the SIGdial organization, which serves as the Special Interest Group in discourse and dialogue for both ACL and ISCA.